[By Nick, discontinued / out of business] After my nightmare inducing experience with Iskream, I was asked if I would review another brand of sugar-free ice cream. As being the nice guy that I am, I said yes with no hesitation. When asked which product they wanted reviewed they said Clemmy’s Vanilla Bean. Dear Reader, your wish is my command. Seeing as I gave some background on Iskream, I might as well give a little on Clemmy’s as well. Clemmy’s was created when the founder, Jon Gordon, was diagnosed with type 2 diabetes. Being a fan of ice cream, Jon wanted to make sure that just because he had to cut out sugar that he wouldn’t have to cut out ice cream as well. After not being able to find any decent sugar-free options, he took it upon himself to create a satisfying sugar-free ice cream. As well as being sugar-free, Clemmy’s is also all-natural, gluten-free and even lactose-free. Clemmy’s actually goes so far as to say that it is “simply the best-tasting ice cream in the world.” Now those are some big words for such a little guy in the ice cream world. vegetables and fruits. Sounds very appetizing I know. Okay the dragged out prelude is over, let’s get to the product itself. I do like the packaging here. The vanilla flower and bean pods are large and given a place of prominence. 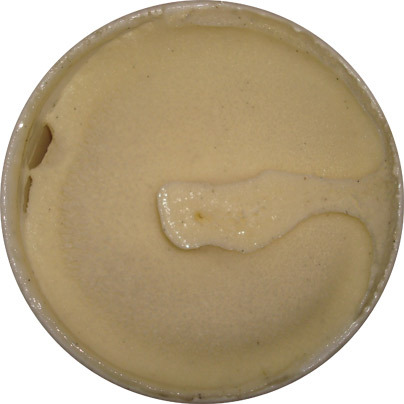 The little dots covering the container represent the actual vanilla bean flecks. It's a small but very creative touch. I mean, come on, it's only vanilla, so they did their best to make the packaging visual appealing to the consumer. Oh fun fact: this pint doesn’t expire until February 2014, I’m not sure if that is awesome or disturbing because of the total lack of preservatives. Either way, I’m ready to try this one. Opening it up, it no longer looks so promising. It almost looks as icy as the Iskream pint. Thankfully that is not the case here. The texture/consistency is surprisingly creamy but with a chew reminiscent of a frozen dairy dessert. This is still highly appreciated compared to the sandy texture Iskream has. Sure there are a few ice crystals throughout but nothing too bad. 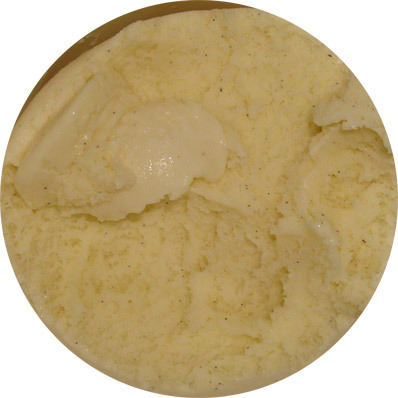 I’m not sure if you can tell from the photos but there are a ton of vanilla bean speaks spread throughout the ice cream. It translates over to the flavor perfectly because I have to say this is one of the tastiest vanilla ice creams I had in a while. It’s so hard to review something as basic as vanilla but when done right its worth commending. It’s very clean and refreshing to be honest. The vanilla flavor is very strong but nowhere near overbearing. It’s nice to have a vanilla ice cream that isn’t just an afterthought or only as a base to hold mix-ins together. This one can easily hold its own. Even with no need to purchase products with no added sugar I could actually see myself picking up this pint again. Diabetics and those looking to cut their sugar intake can rejoice in knowing that Clemmy’s has got your back with a solid ice cream option. Quick Side Note: This stuff doesn’t really melt as much as it turns gummier and pliable. It’s kind of interesting but slightly off-putting at the same time. You’ll want to savor the vanilla flavor but don’t take too long if you don’t want to experience the change in texture. I can’t say it was a deal breaker here but it was a surprising turn of events. 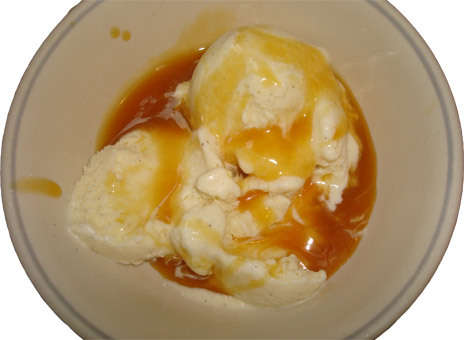 On Second Scoop: This time I decided to top the ice cream with some butterscotch sauce (yes, I know this defeats the purpose of this product but I have no idea how to make a sugar free butterscotch sauce). As you can see, I had a little mishap and poured a little too much sauce onto the ice cream. It’s no big deal really because even with the excess butterscotch, the vanilla bean is still the predominant flavor. It in no way overpowers the butterscotch but actually compliments it very well. I actually believe the vanilla is enhanced by the addition of the sauce which is kind of mind blowing since this was a pretty strong vanilla from the beginning. Once again though, seeing as this took me a little while longer to eat, the texture went from slightly gummy to elastic. Still for being a 100% sugar free ice cream I have to give Clemmy’s props in the flavor department. Verdict? A very good if not great vanilla ice cream with no added sugar to boot. Buy Again? More than likely and I’ll be giving some of their other products a try as well. How funky was the sugar alcohol aftertaste on this one? Nick, you are the best! I am the reader that asked you to try this and I'm very appreciative! Clemmy's is so expensive that I've always been hesitant to try it. Everything else I've tried that is sugar free bites. So glad to know this was good. Will definitely be buying it in the future. I also recently tried Clemmy's for the first time! The toasted almond was soooo good. The other one I tried were the "O's" which were not as good but if you like almond flavored products GET THAT PINT! Really I didn't experience any off aftertaste with this one. I'm not really sensitive to sugar alcohol though so someone else more sensitive might notice something off but the vanilla bean flavor carried all the way through for me. No problem, they told me they offer coupons on their facebook, blog and their normal website so that should help lower the cost. Also I'm not sure where you're located but if you have any price choppers I know the ones in my area have them on sale for 2 for $5 until late september. Actually that's one of the flavors I want to try but I haven't been able to find it. Almonds are one of my favorite nuts so I'll continue to keep an eye out for it. Hey, I agree that this is a damn good vanilla product for no sugar and for it being all natural. There is a slight stevia taste but it is so subtle that you ignore it next to the strong vanilla flavor. Anon, I wouldn't say it's all that healthy compared to normal ice cream but for something sugar free it is pretty good. Most stores around me have actually gotten rid of Clemmy's but I do have a review of another one of their flavors in my backlog and I'll be sure to look for some of their other flavors as well. I just had the chocolate peanut butter one. Oh my, delicious! I literally just tried the chocolate chip for the first time a half hour ago. It was tasty. I ate almost the whole pint. And now, I feel sick. Maybe it's the xylitol, cuz it's obviously *not* from dairy content. Whatever it is, I really will not be buying this again, which is too bad since the taste was good. There's toasted almond???? We only get chocolate, chocolate chip, vanilla bean and chocolate peanut/butter, I have tried them all and love them-however, very expensive for just a pint! It was on sale for 1/2 price at the store so I went for a deal. The reason it was on sale is that apparently a lot of folks who tried it thought it sucked just like I did. HAHAHAHAHAHAHA! That is one of the best comments we've had in awhile. 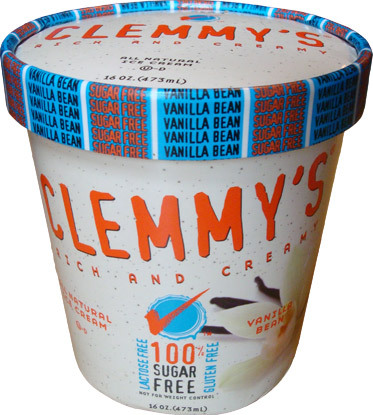 Is there anywhere in Tampa Florida or Fort Lauderdale Florida to purchase this sugar free Clemmys ice cream? Actually, if you dig in to that facebook post, it looks like Clemmys is gone. How do you feel about splenda? Not sure if you have Graeters low glycemic around, but I guess there is always Halo Top maybe? Sugar alcohols are very effective laxatives. Don't eat more then one scoop or you will spend the night on the toilet.